We are just a few days away to witnessing yet another royal wedding and we could not be more excited. If you have not already mentally saved the date, Meghan Markle and Prince Harry’s wedding will take place on May 19th and the best seats are in our living rooms in front of our TV and computer screens. When it comes to her sense of fashion, the Suits actor’s style is undeniably elegant. Whether she is sporting a perfectly tailored coat or light washed jeans with a simple white blouse, the princess-to-be knows how to pull a look together. Since the actress turned royal has been in the spotlight we can not help but notice her effortlessly chic fashion. But – unlike Meghan – we all do not have a princess size wallet. On the bright side, we do have access to pieces similar to Markle’s and have rounded up some of her best looks for you to shop below. Prince Harry and his princess-to-be stepped out for a reception with the Commonwealth Youth Forum in London. Markle welcomed the spring season in a black and white pinstriped Altuzarra dress – we will spare you the details of this pricey (but pleasant) look that can be similarly found at ASOS. On International Women’s Day Markle wore a (relatively) affordable J Crew coat which she paired with skinny black Alexander Wang trousers and a mini leather Altuzarra handbag. Though we hate to be the bearer of bad news for those who were looking to get their hands on Markle’s topcoat it is currently sold out. On the bright side, you can purchase its equivalent at Revolve which is better than not having it at all. Toronto based designer Greta Constantine, Victoria Beckham and Mackage were the masterminds behind the earthy tones on the Suits actress. Markle sported a business casual attire for a day of official engagements in Northern Ireland in a cream crew neck sweater, emerald midi-skirt and a light wool coat. From her shoulders to her ankles, the new royal looked sleeked in a pair of leather leggings, a fitted blazer with a hints of pleating and beige pumps. A simple outfit that you can purchase directly since the prices are within range (maybe we do have a princess sized wallet after all). 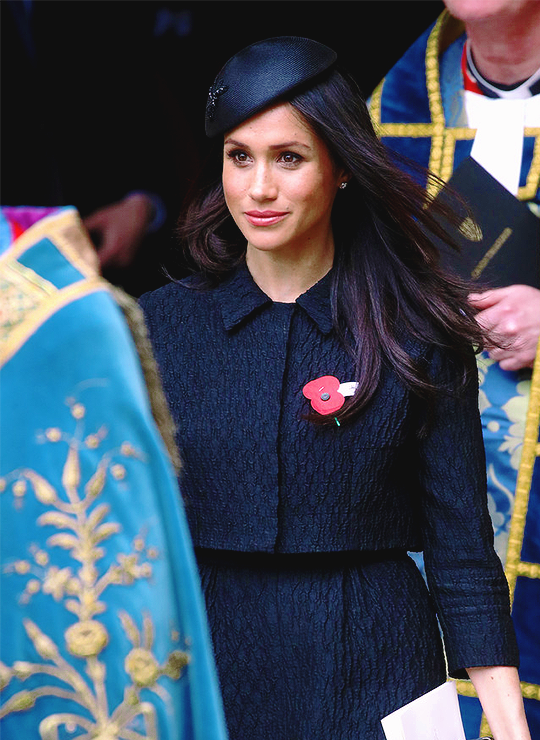 Just last April Markle attended an Anzac Day service along side her royal boo Prince Harry wearing a custom Emilia Wickstead jacket and coat, topped with a Philip Treacy hat. You can find styles just like these at J Crew, Calvin Klein and ASOS – they are without a doubt worth their price.